Pack your bags for a quilting adventure because the American Quilter Grand Giveaway 2018 is on. Register online at americanquilter.com/Grand for a chance to win. More than $17,00 in prizes including a trip to AQS QuiltWeek, a Skyline S9 Sewing and Quilting Machine from Janome, Serger Machine, online classes with iquilt.com, $100 Gift Certificates, and more. 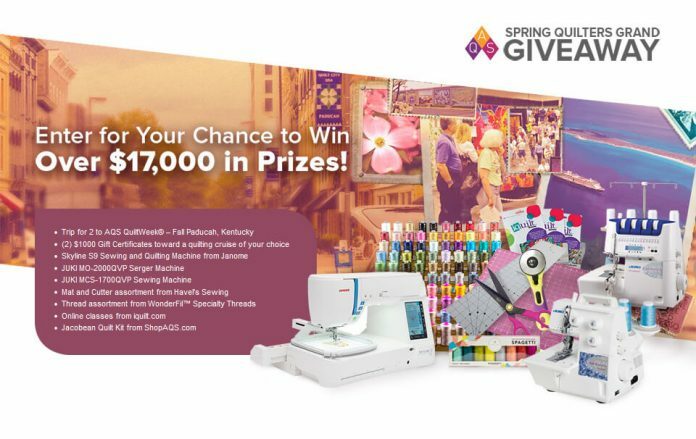 Online: Visit www.americanquilter.com/promos/2018_spring_quilters_grand_giveaway and complete the online entry form by providing your name, complete address, phone number, and valid e-mail address. Grand Prize: One (1) Grand-Prize Winner will receive a prize package to consist of: One (1) trip for two (2) from September 12, 2018 to September 15, 2018 to AQS QuiltWeek® – Fall Paducah, Kentucky 2018, to include: (a) round trip coach class air transportation for two (2) between the major U.S. commercial airport nearest Grand Prize Winner’s residence in the 48 contiguous United States and Paducah, Kentucky, on September 12, 2018 and returning September 15, 2018; (b) four (4) days/three (3) nights hotel accommodations, one (1) double occupancy room in Paducah, Kentucky; (c) two (2) multi-day passes for entrance into AQS QuiltWeek – Fall Paducah, Kentucky 2018; (d) two (2) sets of special event tickets to include: All-Star Review on September 12, 2018 and An Evening with Tula Pink on Thursday, September 13, 2018; and (e) $400.00 cash (US); one (1) $1,000 Gift Certificate per traveler for up to two (2) people toward a quilting cruise of their choice courtesy of Quilt Seminars at Sea and Holland America Line®. Available cruises to choose from: Alaska 4-day land plus 7-day cruise in August 2018; Hawaii 17-day cruise in February 2019; Ireland 14-day cruise in May 2019; Alaska 7-day cruise in August 2019; or Panama Canal 11-day cruise in November 2019 and Airfare reimbursement allowance maximum of $500 for two (2) not to exceed $1,000 provided by AQS; one (1) Skyline S9 Sewing and Quilting Machine from Janome; one (1) JUKI MO-2000QVP Serger Machine, one (1) JUKI MCS-1700QVP Sewing Machine, and one (1) Extension Table MO-2000QVP from Juki; mat and cutter assortment from Havel’s Sewing valued at over $850.00; thread assortment and one (1) wood thread rack from WonderFil™ Specialty Threads valued at $1,523.00; Gift Cards for three (3) online classes from iquilt.com to include: Divide, Design, & Fill for Beautiful Quilting with Lisa H. Calle, Artistic Painted Appliqué with Linda M. Poole, Successful Machine Quilting: Basic & Beyond with Cindy Seitz-Krug; one (1) Jacobean Quilt Kit from ShopAQS.com. Total ARV estimated $15,474.24 (US). 2nd Prize: Ten (10) Second-Prize Winners will receive one (1) $100.00 Gift Certificate for use on ShopAQS.com from the American Quilter’s Society. Total ARV estimated $100.00 each, $1,000.00 total (US). 3rd Prize: Fifty (50) Third-Prize Winners will each receive one (1) copy of the 2019 Quilt Art Engagement Calendar by Klaudeen Hansen and published by the American Quilter’s Society, 2018. Total ARV estimated $15.95 each, $797.50 total (US). This Giveaway is open only to legal residents of the contiguous United States who are 18 years of age or older. Begins at 9:00 a.m. (CT) on February 26, 2018, and ends at 5:00 p.m. (CT) on April 23, 2018. Limit one entry per household and/or per e-mail address, regardless of method of entry. Prize winners will be selected in a random drawing from among all eligible entries on or about May 15, 2018. To learn the names of the winners, go to www.americanquilter.com or send a self-addressed, stamped envelope after May 15, 2018, to AQS Spring Quilters Grand Giveaway, Winners List, PO Box 3290, Paducah, KY 42002-3290. Requests received after December 31, 2018, will not be honored. For complete details about the 2018 AQS Spring Quilters Grand Giveaway, please read the official rules.